HTC indirectly suggests that Samsung's Galaxy S5 has a "bad design"
there’s no mention of Samsung whatsoever, it’s clear that HTC aims to poke fun at the Galaxy S5. 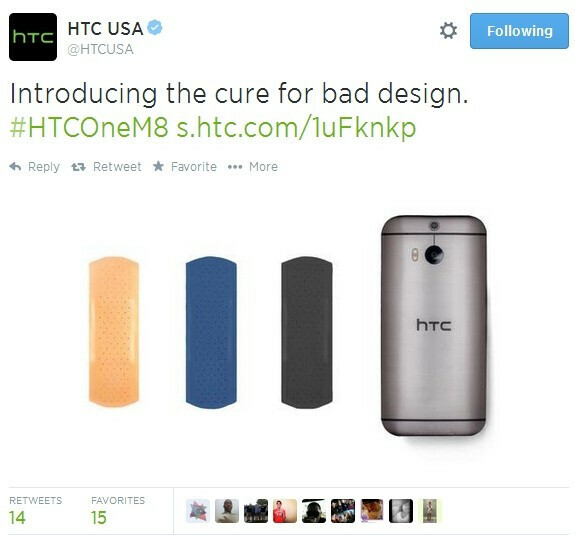 As you can see, the image tweeted by HTC shows its One M8 smartphone next to three band-aids that have colors similar to the Galaxy S5 (gold, blue, and black). We’re not really sure what HTC hopes to accomplish with all this (other than a verbal war between its fans and Samsung’s). Anyway, you can let us know if you agree with what HTC is implying, namely that the Galaxy S5 features a “bad design.” For what it’s worth, Samsung already provided an explanation on why its flagship handset has a dotted pattern on the back. HTC should just relax, Samsung is popular for a reason, they must be doing something right, if not the product then marketing, HTC is obviously doing something wrong. At least Samsung did not straight jack WP live Tile interface design as its default homescreen. "they must be doing something right, if not the product then marketing" Stop with this "marketing" BS, please. There is not marketing that could sell the HTC aluminum tin can crap. And you know that. marketing it is... in PH, they are the only company who bother to have a commercial advertisement, and others.. none. The people who don't even have a knowledge on smartphones i over heard when they saw a display of xperia z2 submerged in water, she said "wow, they copied samsung on being waterproof, I saw it on tv, you can clean samsung s5 with water"
At least bash them creatively and not just copy our day 1 hour 1 jokes. Tells the story why HTC is so far behind, they are not simply late with he joke, they are late and too silly to realize that telling it for the 1001th time makes them look silly. The classic "point A must be true because I agree with point A" maneuver. Well-played, old chap. Well-played. "The classic "point A must be true because I agree with point A" maneuver." It is not maneuver it is my opinion. "Well-played." What exactly here is played? Exactly. Looks are an OPINION. An opinion can never be true or false. Looks are an opinion and in my opinion Samsung Galaxy S5 doesn't look good and that's why I agree with what HTC says because is true to me! :P Ok, ok, maybe I have chosen wrong words to express what I wanted to say. But I read a lot of comments which proves that it is not only my opinion. Samsung should improve design.
" But I read a lot of comments which proves that it is not only my opinion." Yup But those are iOpinions like yours. Not opinions of the millions of the ppl who will NEVER buy aluminum tin can. "But those are iOpinions like yours." Since when my opinion is "iOpinion" ? "Not opinions of the millions of the ppl who will NEVER buy aluminum tin can." Millions of people are already doing that. Also why you are so butthurt about aluminum? "Millions of people are already doing that." ????????? iphones or M7#M8? Do you mean the iboys, iboy? "iphones or M7#M8?" Both! "Do you mean the iboys, iboy?" ??? Samsung doesn't care what some 2nd tier player like HTC says/does. They're way ahead of them. Samsung doesn't care what HTC says about their product but Samsung cares what their customers and potential customers hear about theyr product from other companies! In other words certain part of Samsung customers doesn't feel good when other companies are bashing product which they want to buy or already bought because it makes psychological influence and I'm sure that Samsung doesn't like it. Samsung do what millions of ppl like. And the market prove it. Only iboys buy aluminum, and NOBODY buy M8. Just don't give us the "marketing" BS, because there is not marketing that could sell the HTC aluminum tin can crap. And you know that. What I have said in my comment #61 is a fact you like it or not. You need cool it down dude, the HTC M8 is amazing phone. I am Android user ever since the original Desire came out in 2010 and I am telling you the M8 is the best android phone at the moment. Sure it is not perfect, the camera is barely OK but other than that everything is better than the S5. The "tin can" design makes it feel very slim and snugly in the hand, way better than any Galaxy. So as long as HTC and SONY keep making great design and build quality phones I will never look at a Samsung. If that were the case, the Galaxy S3 would have been metal. We're on the GS5 LTE A and they still haven't budged. Helloooooooooo... How did Samsung reached the top????? By making a phone with top-shelf stats (S2) with an open OS when other Android makers were busy trying to recapture lost magic or genuinely confused about what the next big thing would be, then marketing the crap out of it and continuously improving it from generation to generation? Perhaps the right strategy for HTC is womping Samsung for their poorly located speaker. That wouldn't be as easy to defend as a removable back cover that allows memory expansion and a replaceable battery. Spot on! Referring to their back cover remind me of its warm leather touch, removable battery and micro SD slot. That's why I keep getting Samsung. What I don't like is their bloat ware bundle makes me want to jump ship. Does HTC come with lots of third parties bloatware? Nope , Sense 6 is seamless and free of Sbloatwares. Why not? Samsung did precisely that with their "The next big thing is here" ads with Apple fanatics waiting on line for the next IPhone ("The headphone jack is going to be on the bottom!"). This form of advertising offend Apple fans, not many will switch. Its Samsung angry reaction to Apple lawsuit that did gain some public support. Samsung has since stop these form of advertising because it has stop working to their advantage. Samsung does the same. Actually, they go a step further by paying people to bash other manufacturers . PhoneArena actually published the article several months back. No double standards!